Every baby has the potential to become a Water Baby. Babies are born with over 70 neonatal reflexes. They have the ability to react to stimulation with motor responses. As most neonatal reflexes weaken during the first 6 months, babies need proper guidance to master new patterns of voluntary movement in order to explore the water in a safe and fun environment. 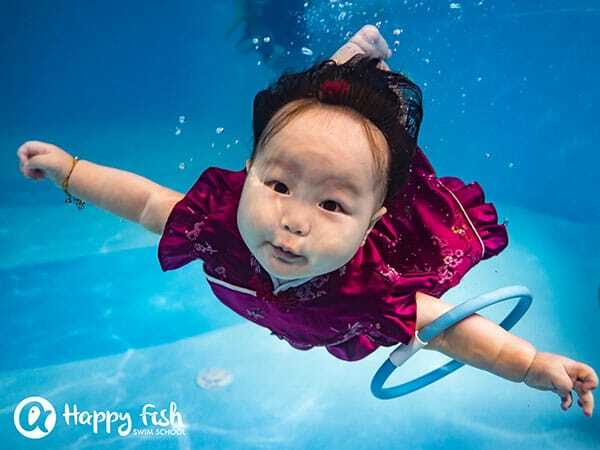 Swimming allows babies to exercise which helps in development of their motor, coordination, lung capacity and balance. Research shows early swimming also helps baby in growing sense of self-esteem, confidence and independence. It is also helpful in literacy and numeracy development. 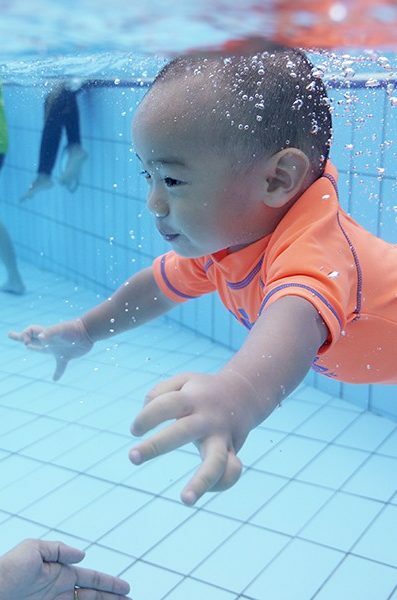 Our aquatic program is designed for babies from 4 months to 2 years old. Babies will learn how to enter water safely, hold their breath when they go underwater, propel themselves to the side of the pool and finally get out of the pool safely. What’s In It For My Baby? * Research done by Griffith University, Australia on 7000 babies. 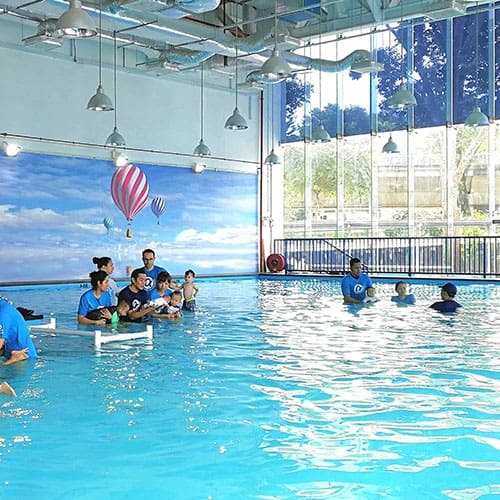 The duration of swimming class is kept short to cater to the learning style of every little child. Parents are encouraged to participate and assist in lessons to make your babies feel more comfortable, reduce feeling of strange and separation anxiety. 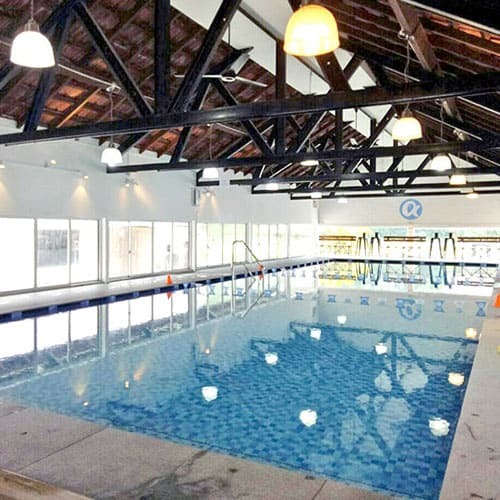 Hence, they will be able to adapt quickly to the new environment in the pool as well as our instructors way more faster! How Soon Can My Baby Swim? Being AUSTSWIM Gold Level Recognised Swim Centre, Happy Fish instructors are certified AUSTSWIM Teacher of Infant & Preschool Aquatics. 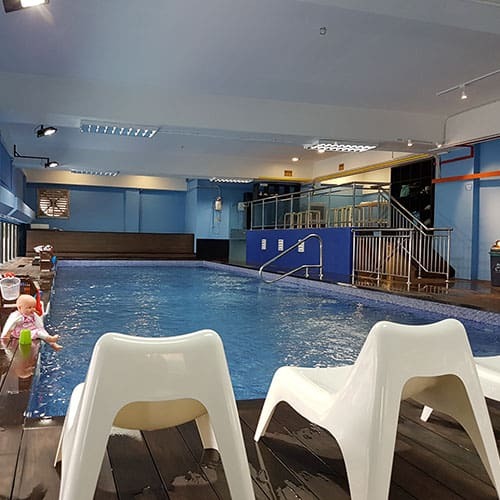 We love to give you and your baby the best swimming experience since birth! 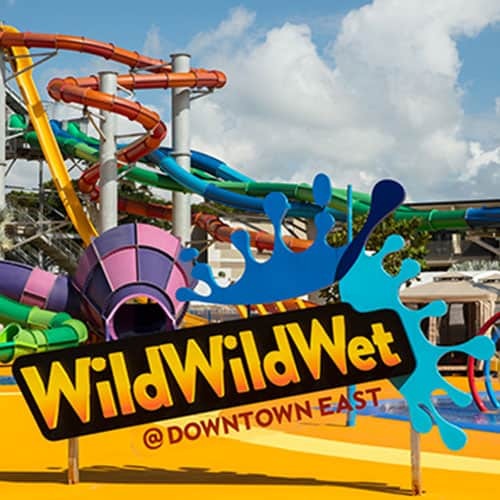 We bring your baby back to the water world just like when they were inside mummy’s tummy. 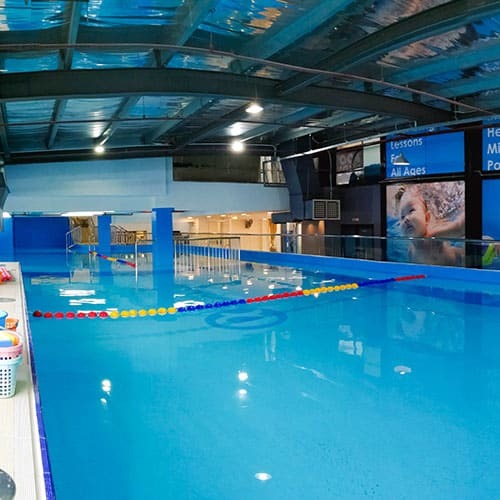 Our job is to train you, parents, to be the best swimming teacher of your little champion. 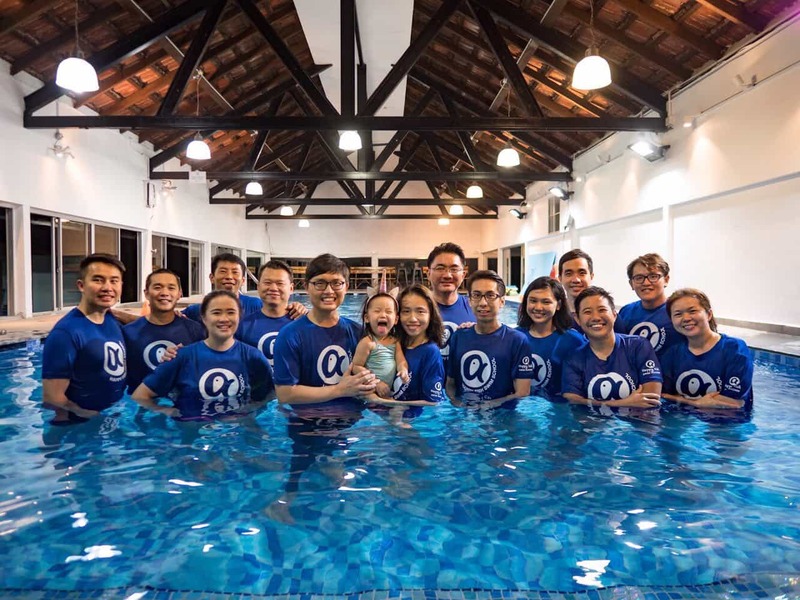 Come and join us to start your babies’ wonderful swimming journey today! Get a complimentary Underwater Baby Videography when you register for 3 terms in a single transaction. Terms and conditions apply. The school will re-allocate students to a more suitable class if necessary to ensure a good learning experience. There will be no make-up lesson for group classes. The school reserves the right to postpone the start date if class size is less than the minimum requirement. 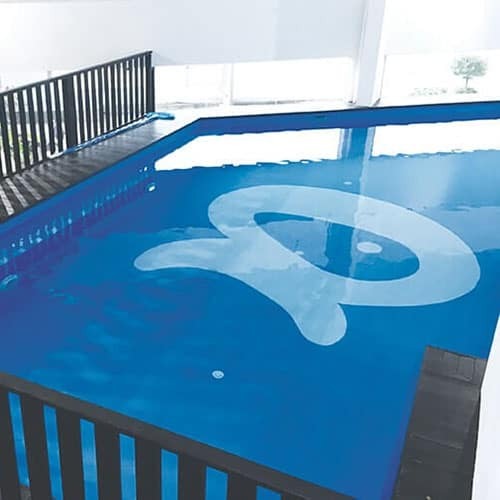 Avoid using “thermal” swimwear at our heated pool. Do I need to be in the water with my baby? How many students in a class and how long is each lesson? Each class is limited to 6 students only. Each session last 30 minutes. Don’t forget to prepare your little one’s favourite fluffy towel to keep them warm after the session. Bring along your baby’s swimwear, snugly fit swim diapers, toiletries, towel and any baby’s favourite waterproof toys. Is there a make-up lesson if my child is not able to attend the class? We used to have make-up lessons on different timing, but a lot of children couldn’t adapt to the new class environment. It also affects the entire class synergy. Hence, we decided to give all students two additional bonus lessons upfront instead of make-up lessons. This will bring the total lessons per term to 12 lessons instead of just 10 lessons. Anyway, if you miss a class, you can still request for a complimentary practise session (Usual price S$15), and your instructor will give you tips on what to practise. Yes, trial lesson at $42.80 per pax, 3 students in a group. Private trial class available on certain timing at Bukit Timah outlet at SGD53.50 too! My child is toilet trained. Why does he have to wear swim diaper? Children will need to hold their breath and utilises multiple muscles when they swim. They may not be able to control or communicate the need to go washroom in time. Therefore, to minimise inconvenience to everyone, the wearing of swim diapers is mandatory for children below 5 years old. Baby can read your body language and any subtle changes. Try to be calm, relax and always put on your best smile! 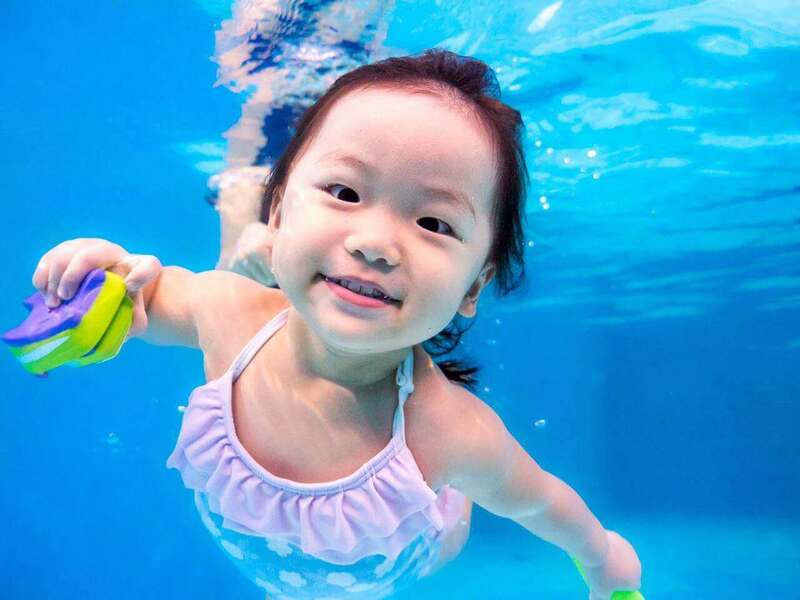 Your little one will soon discover that swimming is a fun and enjoyable experience. Do not expect your baby to submerge or swim very soon after they are introduced to the water. Every little children is individual. Focus on the long term goal and avoid putting pressure on short term achievement. Don’t be over ambitious. Allow your babies to gradually develop and improve at his or her own pace. Practise makes perfect. Every children needs regular lesson and training, never try to hurry! Your child will learn much more in short frequent regular visits than in the occasional long one. If your child accidentally ingested water during the lesson. Cough together and give them a gentle pat on their back. Praise them for trying and don’t forget to put on your best smile! Children needs to be encourage. By doing this, children will enjoy and have fun. If your child cries during the lesson, it doesn’t mean that your child is not ready for swimming lesson. You child may be getting accustomed to the new surroundings, or just having a bad day. 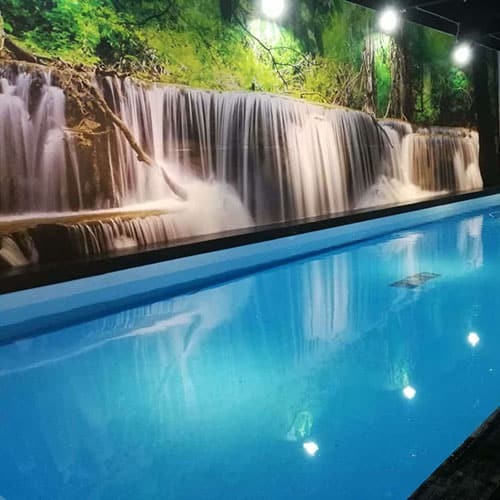 Give your child some time and let him develop his confident, very soon he will be able to enjoy this wonderful experience in a total relax environment with us.